Gardeners often complain that they never have enough good soil or compost. Sometimes you need more than a couple of 40 lb. bags you can pick up at the garden center. A lot more. Maybe your new yard has poor soil or you're putting in raised beds. When you need a large quantity of soil or compost, it's quicker and cheaper to buy it in bulk. Top soil usually refers to the top 2 inches of ground soil. Unfortunately, there is no standard, guideline or law that defines what bulk top soil is. When you see top soil offered for sale, it might be rocky or full of debris, or it might be beautiful loam. That's why it is recommended that you take a look at it before you purchase and have it delivered. Ask around and get recommendations from other gardeners, professionals at garden centers and from your local Cooperative Extension. Most avid gardeners eventually buy in bulk and they'll be the best judges. Get several opinions, because a company's reputation can fluctuate. Even with a few great recommendations, it would still be wise to take a look at the actual product, before purchase. Companies that specialize in providing soils will usually have several blends available, such as top soil, lawn soil, garden soil, and compost/soil blend. Some will even allow you to create your own mix, like 40% compost with 60% top soil. There may be an additional charge for this. 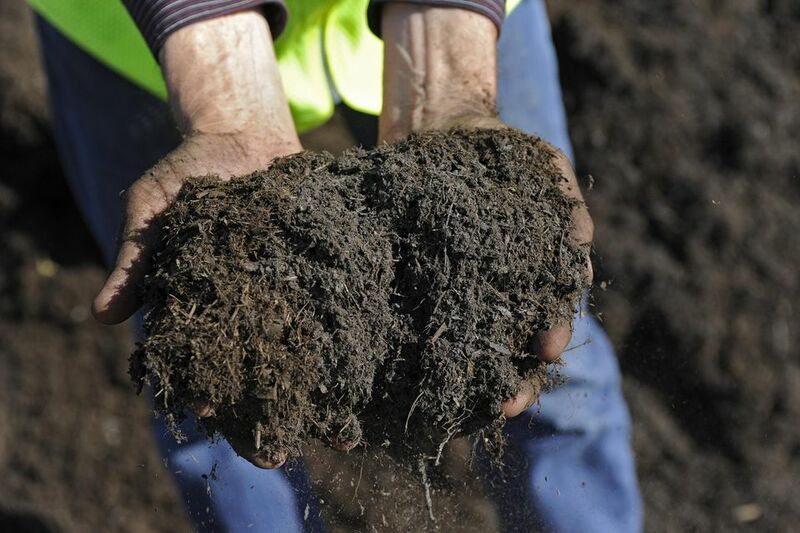 Good top soil and compost should have no odor other than a rich earthy smell. It should be loose and crumbly. Even straight compost should not be coarse or chunky. Freshly made compost may still have some heat, but it shouldn't be hot. For garden soil, a sandy loam is ideal. Look for less than 15% clay and at least 5% organic matter. It should be dark in color, crumbly and loose feeling. There should be some moisture, but it should not form a hard ball in your hand. What is the organic content or at least how much compost is in the mix and what is the compost made from. Many places make their own with yard and leaf waste, others bring in material. What is the percentage of clay, sand and loam. You don't want an excess of clay or sand. Is it screened? You don't want a lot of rocks, litter or clumps of clay in the mix. Is it guaranteed to be at least 98% weed -free. The last thing you need is to bring in soil or compost that is going to sprout and cause you more work weeding. It is possible to have the soil professionally tested, but it will take time and can cost anywhere from $10 to over $100. Some companies may have a soil analysis or some form of certification available, but a good recommendation from someone you trust is your best bet. Prices will vary by location, quality and quantity. There will also be a fee if you want it delivered. Creating quality top soil requires a lot of time, labor and expensive equipment. It's not as easy as sending your bulldozer out to scoop up soil from a vacant lot. If you have your own pick-up truck, most soil companies will allow you to pull in and have the soil funneled into the bed. You will probably need to schedule a time for this. Smaller operations may allow you to shovel it in yourself. Without a truck, you are going to need to have the soil delivered. There is usually a fixed fee for this, depending on the distanced traveled. Give some thought to where you want the soil dumped, when it arrives. A truck full of soil will be very heavy. Driving across your lawn will certainly leave ruts. If the ground is wet, the truck might not even be able to drive on it. It is usually better to find somewhere that you can lay out a large tarp, such as the side of the driveway, and have them dump it there. That means you will have to shovel it into a wheelbarrow and move it load by load, but once it's dumped, you can work at your own pace. If you can't spread the pile immediately, cover it with a tarp. Rain will compact the soil or compost and make it even heavier to move. It can also make an anaerobic compost pile condition which can create a foul odor. Look across to the corresponding number under "Materials Sold by Cubic Yard"
Your garden is 25 feet by 20 feet. Your garden has an area of 500 sq. ft. and you want 6 inches of mulch. The corresponding number on the chart for a 6 inches depth is 54. Divide your sq. footage (500 sq. ft.) by 54. You would need 9 1/4 cubic yards of soil or mulch to cover a 500 sq. ft. garden to a depth of 6 inches.